Ms. Molly Elliott is a mindful nurse practitioner looking after the locality of Birmingham, AL. She earned her master’s in family nursing from Vanderbilt University. She completed her undergraduate studies at Birmingham–Southern College. 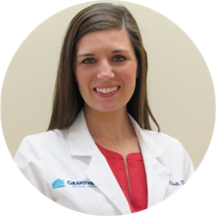 Ms. Elliott is available for exams and consultations at Grandview Medical (Affinity Physician Services). Patients see her for a spectrum of reasons, including dermatology consultations, travel medicine consultations, hypertension, sore throat, and flu shots. She is a member of the American Academy of Nurse Practitioners, the Central Alabama Nurse Practitioner Association, the American Nurses Association, and the Honor Society of Nursing, Sigma Theta Tau International. Ms. Elliott explores many options and customizes all treatment methods for each patient. She majorly focuses on preventive health care and treats patients in a structured manner, focusing not just on the ailment but also on the general well-being of the patient. Friendly, approachable and knowledgeable. As a new patient, I was pleasantly surprised. Highly recommend! I think Molly is very thorough and is very smart and I love all the staff. They are all very on top of things and organized and diligent. Molly was great!!! She listened to me, and she is very caring and professional. She's also very thorough in her exams. I was very impressed with her. This was my first visit and I was pleasantly pleased. I love her professionalism and attention to detail. I have already recommended her to others including my husband. It feels great to have someone care about my health and not just see me as a number. Thank you Mrs. Elliott! I loved her bedside manner! I left the appointment feeling like she really cared about the reason I was there and really cared about what we could do to fix the issues addressed. Her and her team are great! I amdefinitely going to recommend her to others! Thank you Ms. Elliott!